Here is an update of a chart from an earlier post. It has not been simplified, and, to get a readable copy, it will be necessary to click on the chart. The reason for the update is preparation for a new Bible study group, and I always like to begin any subject with the view from 30,000 feet. 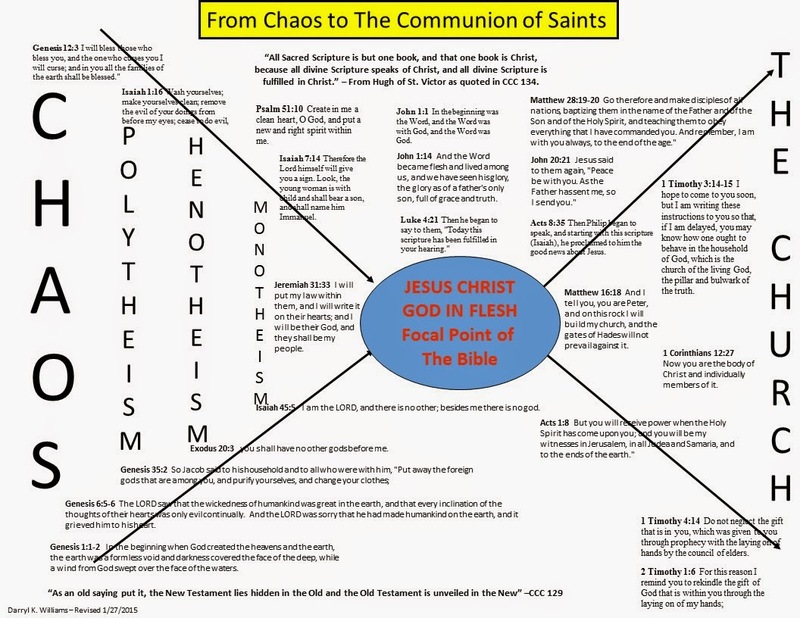 This is an attempt to give a Christian view of Sacred Scripture, the Whole Bible Story, from maybe 50,000 feet...not much detail included. It is a demonstration of my commitment to the *Single Page Principle. We will probably use this by just taking turns reading and discussing each of the verses, context included. * My principle that all important ideas and concepts can, with enough work, be illustrated on a single page. It is an extension of Winston Churchill's position that if someone needed a long speech, he needed very little time to prepare but, if they wanted a short speech, he needed a lot of time.